7th Jun 2013, 10:00 AM in Sparkles! The reference to doilies is actually an in-joke. Well, "in-joke" implies that more than one person will get the joke, and there's no one else on the planet who will, so let's call it a "reference." 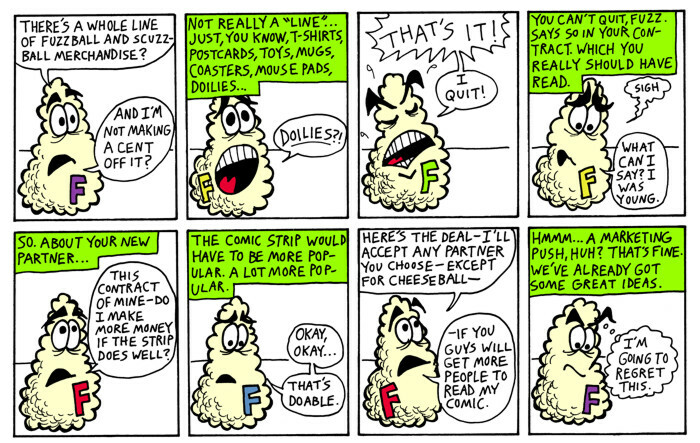 It references the end of the final Fuzzball & Scuzzball strip D. Floyd French and I did for our high school newspaper. Ah, memories . . . It's been twenty years (and a few weeks) since that last Fuzzball & Scuzzball newspaper strip saw print. Good God, how did that happen?